Churchill Home Building Centre put in a big order for about $1 million of stock early this spring in anticipation of a good year, said Dale De Meulles, a lifelong resident of the remote Manitoba town who co-owns the store with his wife Rhoda. Buoying his optimism were a flood of inquiries from customers in even more remote communities in Nunavut to buy much of that stock. The good news was that the store received its stock before severe flooding in late May wiped out sections of the Hudson Bay Railway, the sole land-link connecting Churchill with the rest of the continent. The bad news is none of those inquiries from Nunavut turned into orders. As Rhoda De Meulles explained, the northern customers didn’t bother sending barges to Churchill because the railway wouldn’t be able to deliver their other supplies. Instead, those Nunavut communities turned to shippers in Montreal. “Even though I had merchandise here, they said it wasn’t feasible for them to come because we didn’t have enough to justify the cost of every shipment,” Ms. De Meulles said. While their store is overstocked for the winter — its inventory included 327 car batteries for a community of fewer than 900 people — many products, noticeably food, are in short supply and now have to be shipped in by air at huge cost. A four-litre jug of milk, which had already been expensive by southern standards, now fetches about $18, Ms. De Meulles said. As another example, the air freight cost for a hot water tank is $176 compared to $33 by train. Such costs are something Churchill residents are going to have to bear for the foreseeable future. The railway’s Denver-based operator, OmniTrax Inc., and the federal government were engaged in a Mexican standoff over repairing the rail line and getting it running again. (See related story.) Transport Canada has threatened to sue OmniTrax Canada for $18.8 million if it doesn’t repair the line by Nov. 12. Meawhile, OminTrax is claiming that force majeure — an “act of God” — frees it from its contractual obligations. In early October, the company said it planned to spend $5 million to $10 million to temporarily open the line within 30 days to handle light loads of freight, CBC reported at the time. At deadline, those repairs had yet to begin. The federal government “takes the loss of the rail link seriously and is deeply concerned that OmniTrax Inc. has not yet commenced repairs,” a Transport Canada spokesperson told Canadian Sailings on November 7. Aside from causing a lot of finger-pointing about who is responsible for fixing the rail line, the flood has revived discussion about Churchill as a strategic Arctic port and transportation hub. In recent years, Churchill has been promoted as a gateway to Europe and Asia — and as a means to move minerals from mines yet to be developed in Nunavut, oil and bitumin from Saskatchewan and Alberta, and grain from Prairie farmers. Of those, only grain shipments have ever been realized, and they stopped in 2016 when OmniTrax shut down the port. Various studies in recent years have examined Churchill’s potential as a transportation hub for northern Canada. Among them was a 2007 analysis of an ambitious proposal to build a $1.4 billion all-weather road network linking Nunavut as far north as Rankin Inlet with Churchill and southern Manitoba. Such a network would ultimately connect with the national highway system. While that study identified a technically feasible route, and while such a road had widespread support from First Nations in the area, a subsequent analysis found that the road’s costs would outweigh its economic benefits, CBC reported in 2012. If there’s a prevailing view among those who’ve examined Churchill’s future, it’s that climate change is expected to make the town more viable as a port by adding up to two months to the shipping season. On the downside, the same forces that will melt Hudson Bay ice will also wreak havoc on the permafrost, making land links more difficult to build. Catastrophes, like the flood that shut down the rail line this spring, would also become more likely. In any event, it appears doubtful that Churchill will ever revisit its glory days of the 1950s and 1960s — when it had five times the population of today and was supported by a nearby military base and rocket research range. The Alaska Highway is paved all the way to Fairbanks, just 190 kilometres from the Arctic Circle in the heart of the Alaskan peninsula, where it connects with another paved highway south to Anchorage. In recent years, researchers, engineers, and governments have examined Churchill’s potential as a northern transportation hub. Chief among them was a task force established in 2012 by then Prime Minister Stephen Harper, a Conservative, and Manitoba Premier Greg Selinger, a New Democrat. It focused “on commercially-viable opportunities that are not contingent on additional public-sector spending” and that “the private sector should be the principal driver in pursuit” of the opportunities the task force identified, noted its 60-page final report released in January 2013. • building a pipeline to carry oil and bitumen to Churchill for export. It’s not as though the federal and Manitoba governments haven’t already poured cash into such efforts. From 1997 to 2017, the two governments had spent or were spending a total of $197 million on Churchill. Of that, the feds paid $124.9 million. Of the overall total, $50.5 million was for the port and rail transfer to Omnitrax, and another $48 million was for rail line rehabilitation and port upgrades. Grain shipping incentives accounted for another $25 million. Rail- and port-related expenditures (including the grain incentives) added up to $129.4 million. Given the history of recent oil pipeline proposals in Canada, one destined for Churchill is bound to encounter stiff opposition. And for ammunition, opponents can turn to a recent University of Manitoba report on climate change in the Hudson Bay complex that called the bay “particularly vulnerable to a potential oil spill.” That report, by the university’s Centre for Earth Observation Science, also said the port’s shipping operations are “vulnerable to adverse weather” and that those operations “may be rendered more vulnerable by a lack of hydrographic data” as well as the limited search and rescue capability of the Canadian Coast Guard in the area. “There is some concern that Canada is not equipped to handle the increased traffic volume in Arctic waters. Specific attention has been focused on the Coast Guard’s fleet of icebreakers and whether they are capable of meeting current and future user needs in the Arctic,” the report said, citing a 2014 report from the Auditor General of Canada. Among the roles of Canada’s six ice-breakers in the Arctic is to assert Canadian sovereignty in the region. But during winter, the nearest ice-breaker to Hudson Bay is stationed off the Newfoundland coast, the report said. Churchill has the potential to serve as a port for bulk potash shipments, given its proximity to mines in Saskatchewan. One barrier to that is the major mines already own Canpotex, a network with its own terminal in Vancouver. “Any opportunity to export potash may have to exist with independent mines that would operate outside the Canpotex network,” the 2013 Churchill task force report said. Serving new mining operations in Nunavut presents another opportunity, the report said, noting that “a single gold mine, for example, can require between 40,000-50,000 tonnes of materials annually during construction, and 20,000- 25,000 tonnes thereafter during the life of the mine.” In comparison, the average annual resupply that Churchill has handled for Nunavut in recent years totalled around 10,000 tonnes. Unfortunately, supply chain service issues damaged the reputation of the port’s owner, which “resulted in loss of business” to Nunavut, the report said. A “dearth of surface transportation infrastructure” and volatile commodity prices will mean that only the richest finds will become commercially viable because the mining firms will have to pay for “their own transportation infrastructure,” the 2013 task force report said. Even building a winter road would be costly and “require commitment from both the private sector and governments over several years” to assess its benefits. But, a road from Gillam to Churchill is feasible, said University of Manitoba engineering professor Dr. Marolo Alfaro. He estimated that such a road would cost about $2 million per kilometre — or about $600 million for its 300-kilometre length. That’s less than the nearly $3 million per kilometre for a 130-kilometre all-weather road between Inuvik and Tuktoyaktuk that was due to open to traffic on November 15. Dr. Alfaro wasn’t involved in designing the Tuktoyaktuk route. But for the last two and half years, he has been undertaking measurements of synthetic reinforcing material that were placed on parts of road. Data from those measurements, which looked at such things as sloughing and drainage of the road bed, could help improve the design of a future road to Churchill. Dr. Alfaro has also been using instruments to measure roads built over peat in another part of Manitoba. For that, he has adapted a 16th century technique, know as a corduroy road, which uses timber to support the roadbed. In his case, however, rather than placing the timbers underneath the roadbed, they are positioned at the toe of the road to contain the fill material. Dr. Alfaro is hopeful his research will aid in designing roads in the north that take into account the effects of climate change. “That’s why we are taking measurements, temperature measurements, both in the foundation and the fill material. We want to calibrate the model that we’ll be developing. Once we have confidence in our numerical model, we can use that model to design highways that take into account climate warming in different scenarios,” said Dr. Alfaro, who has also been researching ways to improve the reliability of the Hudson Bay Railway line. Stephanie Puleo, interim Executive Director of Churchill Northern Studies Institute, 23 kilometres to the east of Churchill, sounded lukewarm to the idea of a permanent all-weather road, however. “I know there would definitely be a lot of concern it because maintaining a road would be a lot of trickier than maintaining a train rail line,” Ms. Puleo said. 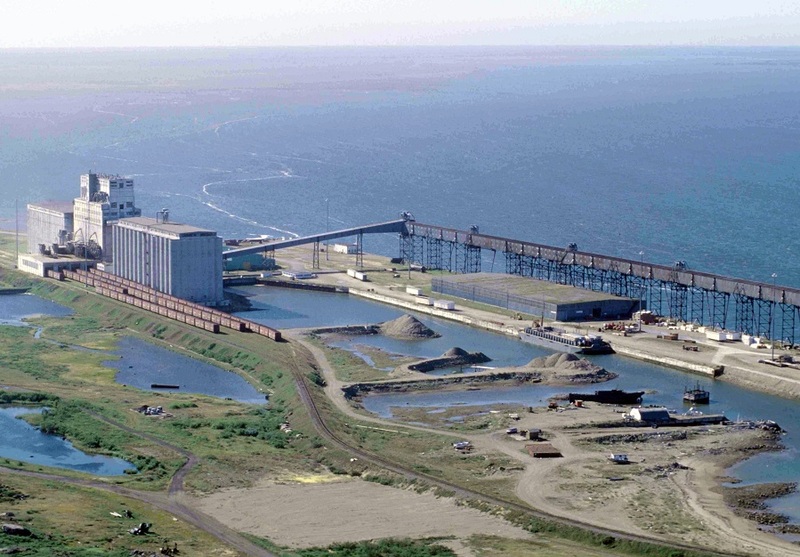 People would also like to see a marine biology lab built on Hudson Bay. It was also suggested that the former naval base could be made into a fish farm to rear arctic char, pike, and other species. Residents also recognized “the importance of and their essential dependence on the railway,” although some expressed criticism and dissatisfaction with foreign ownership of the line and the port, the report said. Elden Boon — President of the Hudson Bay Route Association, a non-profit organization that advocates for the railway as regional asset — said building a road would simply be too costly compared with the cost of repairing the railway. “I just don’t see the merit around that when you’ve got a rail line that just needs to be repaired and you’re back in business,” said Mr. Boon, a farmer from Virden, Man. Transport Canada spokesperson Annie Joannette skated around questions about a proposed all-weather road to Churchill, saying Transport Canada is committed to the restoration of rail service. She also acknowledged a proposal to build a winter road to ship supplies into Churchill. Mark Kohaykewych, President of Winnipeg-based Polar Industries, the company proposing to build the road, didn’t respond to an interview request. However, he told CBC News in October that his company — which would develop the road in partnership with the Fox Lake Creek Nation and Churchill-based Remote Area Services — would use tracked- or large-tired vehicles such as tundra buggies to haul supplies on enormous sleighs. “This is a primitive form that was used in the ’70s by many companies to transport goods to remote communities and we’re going to go back to that, pulling cat-trains and sleighs into Churchill,” Mr. Kohaykewych told CBC. Ms. De Meulles said in early November that her preference would be for a proper ice road to be built to enable all vehicles to use it over the winter. At present there is no such road. One of the big ideas the summit explored was an Arctic shipping bridge to connect Churchill with Russia port of Murmansk, a city of 300,000 people on the Arctic Ocean. A few years ago, OmniTrax was also promoting Churchill as a gateway for moving project cargo between Canada and Asia. But references to that scenario have since been scrubbed from the OmniTrax website. The report recommended a “holistic approach” to Churchill sustainability even as it recognized the broad scope of the challenges. “Whatever the future may bring, a strong and resilient community that understands its needs and resources, and whose members know how they can work together, is in a better position to deal with threats and gain benefits from opportunities,” were the report’s last words.